How the Fallen were Mighty. The fortunes of football clubs inevitably wax and wane over the years; some erratically, others less so. Promotions, relegations glory and despair are the spices that combine to produce the fare enjoyed, or endured, usually in fairly unequal proportions by staff, players and fans across the world. With such unpredictable trajectories, it’s perhaps inevitable that when some collide and their paths cross, a bond is formed that outlasts the initial contact. Some kind of familial link is established that as their roads depart and disappear over distant horizons, stays firm, drawing them back together again. Such a case could be made for Welsh club Newport County and Carl Zeiss Jena, originally the official works team of the Carl Zeiss optical factory based in the former-East Germany town of Jena, a couple of dozen kilometres or so from the the Weimar, of Republic fame. That both clubs have a fairly robust link with local industry creates some kind of kinship, but the relationship really dates back early 1981 when the clubs met in the quarter-final of the now-defunct European Cup Winners Cup competition. For both clubs, it was a zenith moment in their histories, and both have suffered a diminution of fortunes since. The German club had undergone a number of incarnations since the club became founder members of the DDR (East German) Liga in 1950. Rechristened as Carl Zeiss Jena in 1966, although they had won the national ‘Oberliga’ title a few years earlier, it was in this guise that their success story really took shape. Nominated as one of the DDR’s ‘focus centres’ for football, a number of talented players found their way to the club and the following fifteen years or so saw a rise in their fortunes, becoming the dominant force in the country for the following decade. They secured two more titles, and finished as runners-up on a further half-dozen occasions, winning the East German Cup in 1972, 1974 and 1980; the last of these gaining them entry to the European tournament where they were destined to meet Newport County. The Welsh club’s recent history was much less spectacular. Five years before their European exploits, Newport had finished 22nd in the old Fourth Division of the Football League, compelling them to apply for re-election, should they wish to hold on to their league status. It would be the tenth time the club had needed to go cap in hand and ask other clubs to preserve their position in the league structure. Financial pressures had led to the brink of bankruptcy, and although re-election was secured, the early parts of the following season suggested a similar request may be required at the end of the term. An amazingly unpredictable run of five successive wins from their final fixtures however, culminating in a last day victory over Workington, meant such indignity was avoided, and the club took its place for the 1977-78 season by right, rather than due to the largesse of others. From there, Newport began to prosper, eventually gaining promotion to Division Three at the end of the 1979-80, again with a final day victory, this time against Walsall. The same season also brought cup success to Somerton Park. In a Welsh Cup Final, played across two legs, against Shrewsbury Town, Newport secured a 2-1 home victory on 6th May; both goals netted by the club’s legendary goal-scorer Tommy Tynan – who was also to have a big say in the game against Jena. They then travelled across the border to Shropshire for a 0-3 victory, Tynan again amongst the goals alongside Welshmen Steve Lowndes and Dave Gwyther, the latter two at least giving a celtic veneer to a Welsh Cup Final where only one team was from the Principality, and only three players across both legs were Welsh. The victory however had given Newport their passport to European competition. The first rounds of the competition offered up wildly different opponents for Newport and CZJ. Whilst the Welsh team were paired with the Northern Irish part-timers of Crusaders, the East Germans were invited to the Eternal City to face the might of Roma. A satisfactory 0-0 draw away, and then a comfortable 4-0 victory at home saw Newport through, but for CZJ, the route was far less straightforward. Goals in the away leg by Pruzzo, Ancelotti and Falcao gave the Giallorossi a seemingly safe three goal advantage to take behind the Iron Curtain. Back in the familiar surroundings of the Ernst-Abbe-Sportfeld, however, CZJ were transformed from the hesitant and overwhelmed team that had struggled in the Italian capital, and goals from Krause and Lindeman pulled them back into the contest with 20 minutes remaining. Bielau then squared the scores, before netting the winner securing an improbable turnaround with just three minutes remaining on the clock. The second round draw also seemed to favour the Welsh club. After easing past the part-timers of Crusaders, they were paired with Norwegian club Haugar, whilst CZJ came out of the pot with Valencia of Spain. At the time, Haugar were managed by former West Ham United and Millwall player Dennis Burnett, and the British approach he brought to the club had seen them promoted to the top division of the Norwegian league, just before the first leg was to take place in Norway. Torrential rain was to turn the pitch into a mixture of mud and sawdust, imported to make the surface remotely playable. Even with that however it was hardly conducive to anything resembling productive football and Newport were probably happy to escape with a goalless score-line. Back in south Wales, they comfortably progressed with a 6-0 victory. Tynan netted a brace and others by Gwyther, Lowndes, Aldridge and Moore were simply too much for the Norwegians. Apparently confirming the widely-held opinion at the time that Iron Curtain teams do not travel well, CZJ again lost the first leg. This time however, it was only by a single goal margin and back home, despite a few nervous moments, they were able to progress with a 3-1 victory. The scene was therefore set for the quarter-finals, and the draw pairing Newport County with Carl Zeiss Jena. Other options could have paired Newport with the likes of Benfica or Feyernoord. With victories behind them against Roma and Valencia however, CZJ appeared an enormous task for the Welsh club. Up to this point, both clubs had played the first legs away, before deciding the tie conclusively in the home leg. This time, CZJ would be at home first. The pressure therefore would be on them to secure a strong position before journeying to Wales. Reviewing videos of the first leg played in Jena, it’s not hard to imagine that many Newport players may have had memories of the sodden pitch in Norway against Haugar, or a rain-lashed Somerton Park when the match began in East Germany. To call the pitch ‘heavy’ is probably an understatement but, if it’s not being too demeaning of the Welsh club, it may have been a bit of a leveller. The nature of the goals on the evening certainly were more of a determined than creative manner. After a fairly confident start, with Newport pressing forward without any signs of inferiority, the East Germans, in a kit of white shirts with narrow blues hoops on the front began to assert themselves, and with just over 20 minutes gone of the first half, they took the lead. A ball, hopefully hoisted into the Newport box from the right was not dealt with, and after a minor scramble, Jurgen Raab swept the ball home. The reverse was a novel experience for Newport, being the first goal they had conceded in the cup run. If the home fans had then expected the Welsh club to wilt, they were to be disappointed. The game proceeded towards the break with the Germans in the ascendancy, but without adding to their lead, or quietening the Welsh fervour. It was therefore of little surprise when Tommy Tynan performed his party piece and netted an equaliser. A free kick just inside the Newport half was flicked on at the edge of the area. The ball dropped to Tynan who swivelled before firing in a shot that eluded Hans-Ulrich Grapenthin. He then spun away, arms aloft and fair hair billowing behind him, to celebrate with his team-mates. For all of the CZJ possession and pressure, the half-time break came with the scores level, and the away side now also had the priceless commodity of an away goal. To no-one’s great surprise, the second half was played mainly in Newport’s half of the field with the CZJ players pressing relentlessly. With determination and endeavour however, the Welsh club held out and as the last ten minutes arrived, it seemed a famous that result was in their grasp. There was drama to follow though. With just five minutes remaining, a corner was played in from the left and after a couple of inconclusive aerial duels Raab reprised his first half act by prodding the ball home. The Germans celebrated wildly. At least now they would have a lead to take to the away leg. The referee was looking at his watch as Dave Gwyther picked up a CZJ clearance on the right-hand side of the halfway line, ploughing a determined furrow, he slipped past an initial challenge and closed to the edge of the penalty area. Another defender was beaten as he reached the goal-line, before jagging back inside a third challenge. Head up, he then slid the ball back to a team-mate, but a challenge saw the ball fall back to him. Awake to possibilities, he spotted Tynan lurking on the edge of the six yard box, and played the ball to the striker. Neatly controlling the ball first time with his right foot, Tynan cleared the defender before sweeping home the equaliser. The teams lined up for the restart, but no sooner had the ball been played, the referee blew for full time. Newport had got a 2-2 draw. Two away goals and the home leg to come. Glory was beckoning. Things looked even more positive for the Welsh club when CZJ arrived in Wales with half a team missing through injuries and suspension. At kick-off, a capacity crowd of 21,000, shoe-horned into Somerton Park had travelled the journey of hope from improbable success through the possible, and felt that they were now comfortably emerging onto the positive side of the equation. The early passages of the game certainly seemed to give credence to such feelings. A succession of corners in the first half saw the CZJ defence under aerial bombardment as crossed were whipped in and headers won by home players. Captain Oakes and Dave Gwyther both had powerful headers cleared from under the crossbar that Newport players claimed had actually crossed the line. Having watched the videos of the game, it’s impossible to judge the veracity of such claims, but the positioning of the referee, frantically waving play on amidst claims, suggest he had about as much idea as well. By the break there had been four last gasp clearances by the East Germans, plus a couple of important saves by Grapenthin thrown in. At the other end however, there had been a goal. Home goalkeeper Plumley had been called on to snaffle a couple of fairly tame shots, and then also to shuffle a Raab shot around the post for a corner. 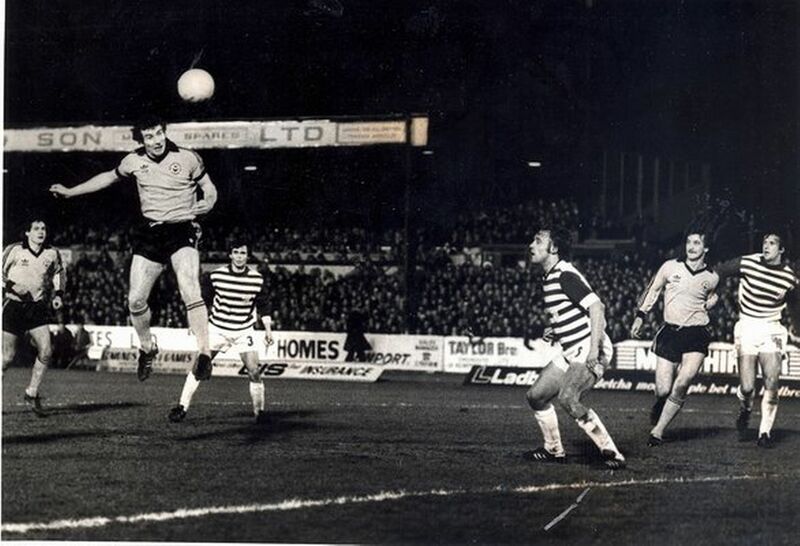 When a free-kick from CZJ skipper Lothar Kurbjuweit found a hole in the Newport defensive wall however, taking a deflection, Plumley was rooted as the ball flew into the net. Many football fans will tell of the dread fear that begins to take over the emotions when your team is on top, firing in chances, but just failing to convert. There’s often a price to pay in an unjust goal, and Newport fell victims to it. For a couple of minutes the belief seemed to drain from Newport, but after so short a fleeting doubt, they redoubled their efforts. Headers and shots flew in that found the knees, feet and legs of defenders, and those that escaped the maze of East German limbs were parried by Grapenthin. The one time that a Tynan effort managed to evade all defensive efforts, his left-foot shot from just inside the box, cannoned back from the bar. Despite the almost relentless pressure, it seemed to be all over when a last minute ball came in from the left, Moore, supplementing the attack flung his head at it, powering the ball towards the net. It was not to be Newport’s night though and Grapenthin threw himself towards his right to produce a wonder save. The moment summed up Newport’s fate. Their European adventure was over. For both clubs, the Cup Winners Cup run appeared to be a peak. Afterwards a decline set in. A couple of seasons later, Newport were unlucky to miss promotion to Division Two, but the failure also heralded a fall in both performances and finances. Successive relegations followed in 1987 and 1988. The following year with debts of over a quarter of a million, Newport County was would up in the High Court. It was less than seven years since that famous quarter-final. Due to the fortitude and resolution of fans however, the club has been reborn, rising back through the leagues from the humblest of renaissances. Any repeat of the exploits of 1981, remain a distant dream, but at least there’s life in the club. CZJ has also experienced a tumble in their fortunes. After the reunification of Germany in 1990, they were placed in 2 Bundesliga, but in 1994 were relegated to Regionalliga Nordost. For the following dozen years or so, they fluctuated between the two, before being relegated again in 2008. By this time however, 3 Bundesliga had been launched, and despite their second team being embroiled in a betting scandal in 2009, they stayed in the third tier of the German league until 2012, when a further relegation saw it return to the Regionalliga Nordost. If Newport’s fate, post-1981 has been demise and rebirth, CZJ may still have some falling to do. The issue centred on the safety of the stadium’s floodlights. The owners had decided to close it down with immediate effect. A decision said to have stunned Zipfel who added that there would be little chance of locating a viable alternative venue with such little notice. Eventually the game went ahead however, ending appropriately at 2-2; reflecting both the original score-line from back in 1981, and a spirit of friendship. The following year, Newport reciprocated, inviting the German club to play a pre-season friendly in Wales. This time, however, it was the Welsh club who had ground problems, with their Rodney Parade pitch being deemed to be unready, and the game was switched to their former home of Spytty Park. A step down from the 12,000 that crowded Somerton Park, there was still a healthy 2.600 spectators, with some 1,000 reportedly making the trip from Germany. The score in this game also echoed that of 1981, but this time the winning goal was for the home team as Darren Jones headed the only goal of the game. No discussion as to whether that one had crossed the line. If football is about competition, it is also about shared experiences. The 1981 Cup Winners Cup quarter-final between Newport County and Carl Zeiss Jena demonstrated not only how competition can draw unlikely rivals together but also how such events can build bridges that allow people to cross great divides. Perhaps one day, not too far down the line the two clubs will meet again in more earnest competition. If they do memories will doubtless return to 1981 and how two different trajectories coincided in that moment, creating a link that still prevails, surpassing promotions, relegations, glory and despair. (This All Blue Daze article was originally produced for the ‘thesefootballtimes.co’ website).